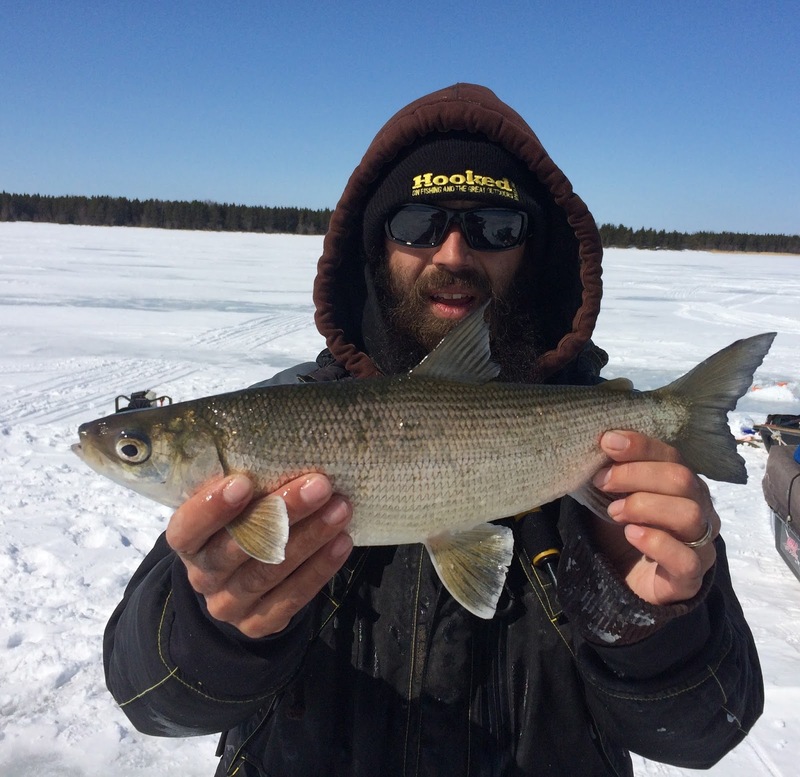 One of Manitoba's top drive-to fisheries has got to be Cedar Lake and when an opportunity to ice fish this diverse lake came up, I jumped on it. In perfect driving conditions it is roughly a four and a half hour drive north from Winnipeg but perfect the conditions were not. As we finally turned down the road towards Moak Lodge, the biggest lynx we had ever seen walked onto the road and sat down in the middle a few hundred feet ahead of us and then quickly pounced away before a photo opportunity presented itself. We hadn't even reached the cabin and I was already having a blast! After checking in with Chris, owner of Moak Lodge, we unloaded what we needed to at our winterized cabin and prepped the sled for travel and fishing. Dave had a plan of attack with a few spots in mind so we went out in pursuit of whatever may bite. 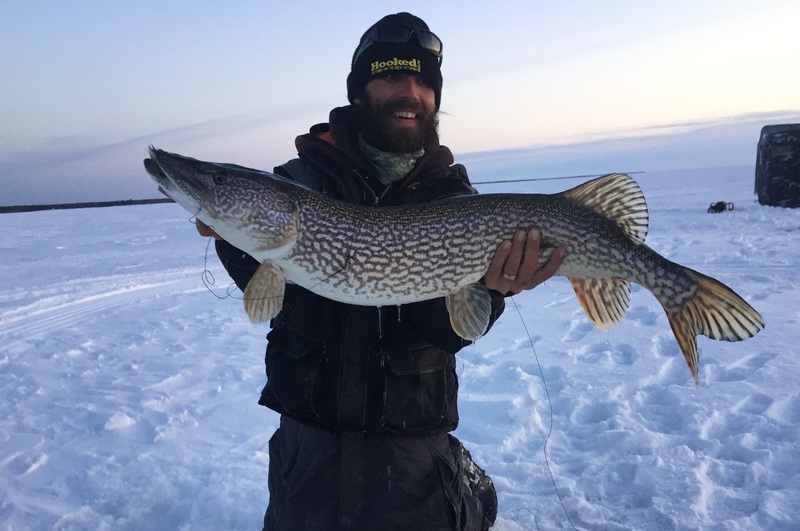 We prospected a few spots from 4 pm until the darkness took hold with Dave landing 3 pike and a burbot and I luckily landed a single 28 inch pike. The fish seemed finicky but at least we weren't skunked. We were the last ones back to camp to share some great food, stories and drinks between the group well into the early hours of the morning. Half our group headed off in pursuit of some fresh tulibee for tip up bait, while the rest of us went off to some deeper water adjacent to a spawning bay in hopes of some big pike. We drilled 2 lines of 10 inch holes covering depths from 7 to 22 feet under the ice and quickly got to setting up tip ups with thawed tulibee and jigging different presentations in other holes. 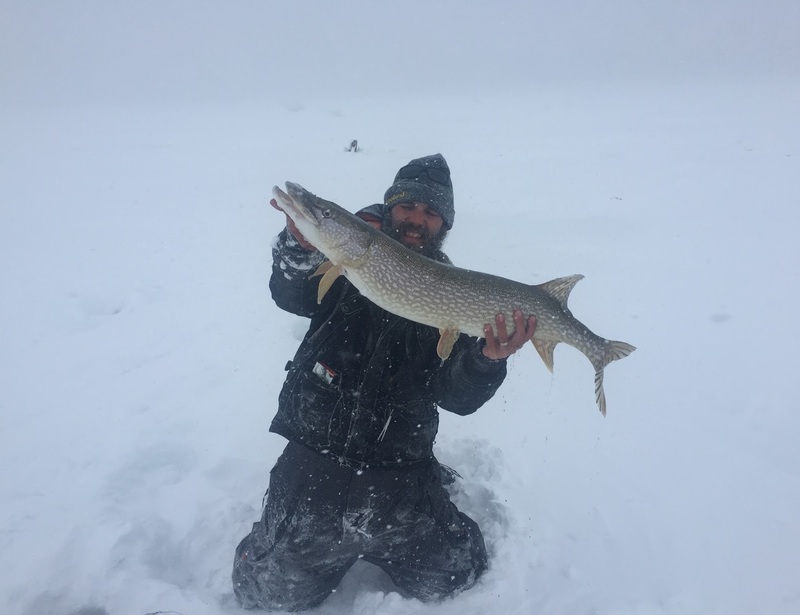 We ended up catching a few pike with the biggest topping out at this spot around 30 inches, I also ended up landing 5 tulibee with the biggest almost 19 inches. We really thought it was just a matter of time before a big pike would come by in pursuit of the bees but after a while we decided to prospect some other areas in hopes of bigger pike. Off we went covering many kilometers on sled, most spots we tried did not produce and we were kicking ourselves for leaving a semi productive pike and tulibee spot for cold winds and minimal bites. With most of the group hungry and defeated Kris and I decided on one last spot for a "Hail Mary" chance at some more fish. With the holes drilled and flip over set up Kris got to setting our 2 tip ups while I dropped a jigging spoon down to a mark holding on bottom on my flasher screen. 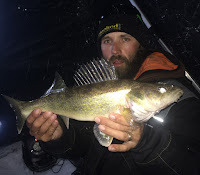 Before I could see the spoon on the screen I felt a distinct tap and set the hook bringing up a nice eater walleye. The action ended up being pretty steady and we were well entertained until the bite finally died off an hour after dark. We had a few flags go off during our time there and I ended up with a nice pike just under 40 inches. 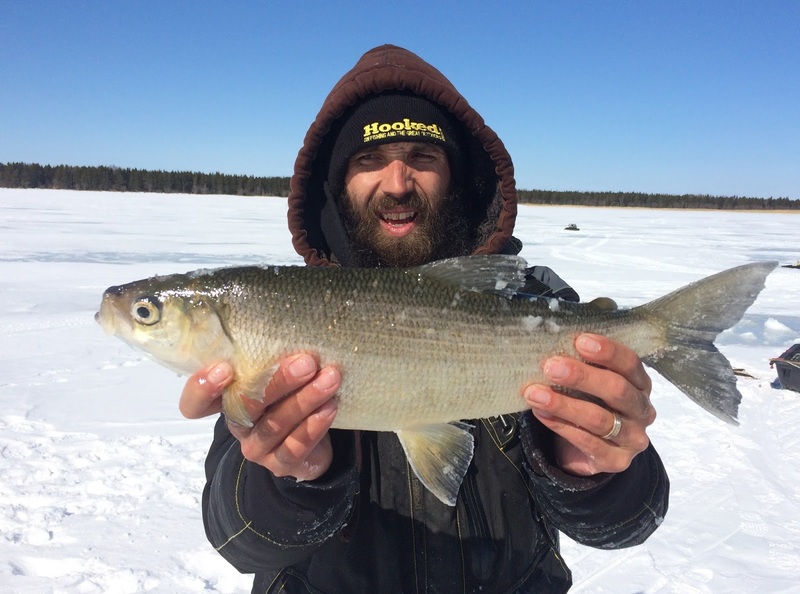 12 hours on the ice, 5 spots tried and over 25 km of sled travel made for one heck of a day of fishing. A fantastic camp style steak dinner topped off the evening. The third storm front of our trip was to move in by lunch and Chris had some time to fish and had a spot in mind he wanted to try. 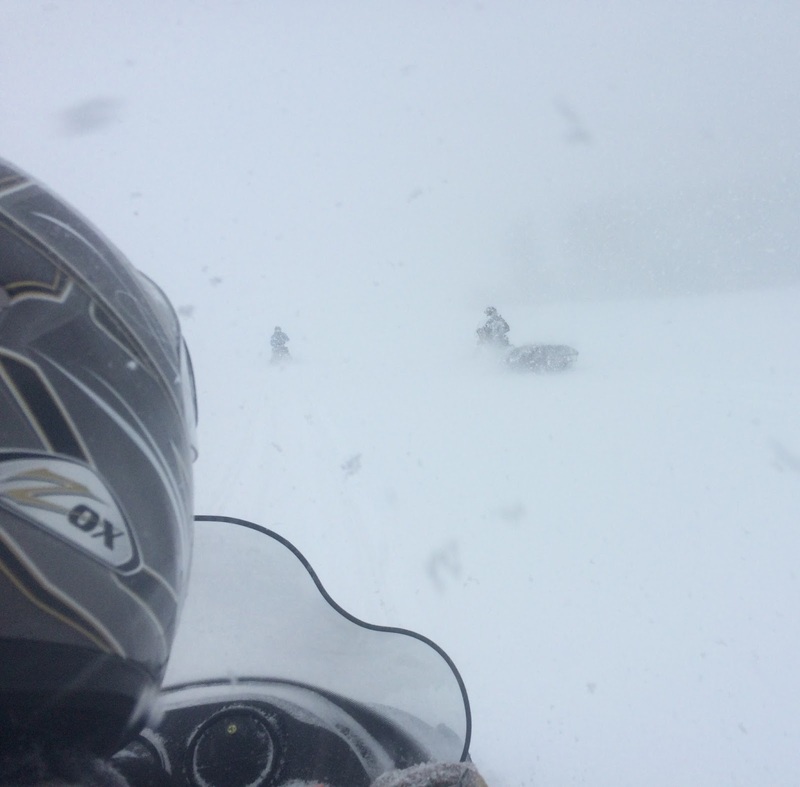 We headed out on 3 sleds with enough supplies and equipment to survive a few days in the bush if something went wrong and met the storm just as we reached our spot six miles away. 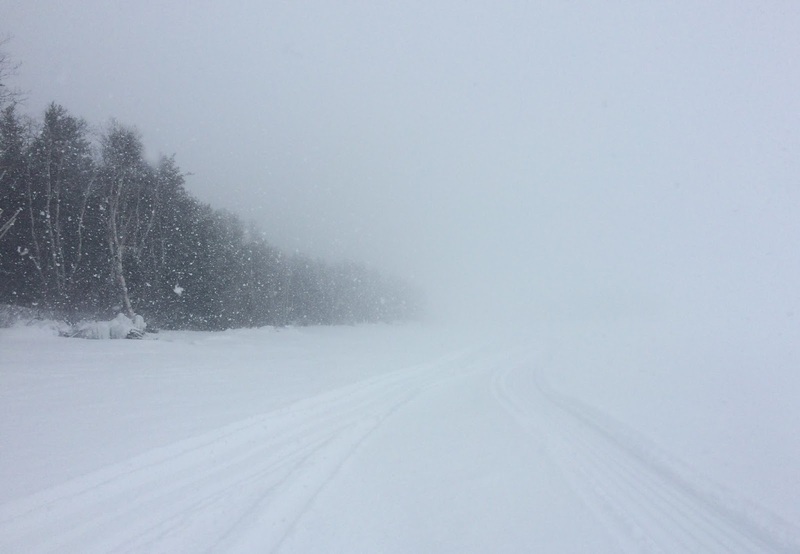 The wind was horrendous and we were soon in near whiteout conditions and the fishing was far from stellar. 90 minutes of fishing produced one 32 inch pike on a tip up so we packed up and headed back towards camp. The ride back was one hell of an adventure that won't soon be forgotten, thank goodness for Chris' experience and GPS. We ended up warming up for an hour at the cabin and rallying the troops to head to the productive spot we had found the evening before. It wasn't too far from camp and if we all stuck together and communicated, hopefully we could find some aggressive fish again. 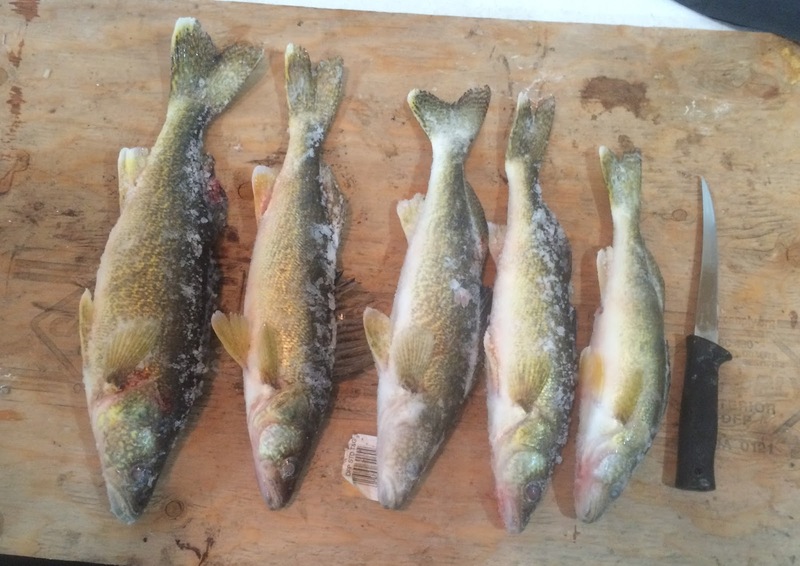 A few more pike were landed with 38 inches being the biggest and then 30 minutes before dark the walleye seemed to flip a switch and start biting. We ended the day with a well prepared fish fry between the group, sharing many more stories and drinks.